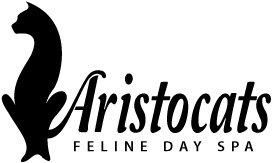 The team at Aristocats aim to provide your cat(s) with a pleasant and rewarding grooming experience. Kitten’s First Haircut: The first grooming experience for a kitten (or any age cat) requires patience and understanding. More time may be necessary to work with younger cats. Gradually adding steps to the grooming process on a regular basis will help to minimize any potential stress. Owners can help their cats accept grooming by regularly handling cat’s paws as well as combing their coats. Frequent gentle handling can help cats better accept grooming. Matted Hair Removal: Cats with matted coats need extra attention during their grooming session. Matts left in a cat’s coat only grow tighter and can strangle the cat’s skin or eventually tear it open. Aristocats does not wish to cause serious or undue stress to your cat and will not continually de-matt your cat for you. Matts can be very difficult to remove and may require the cat to be shaved. When necessary, removing a heavily matted coat includes risks of nicks, cuts or abrasions due to warts, moles, or skin folds trapped in the mats. Heavy matting can also trap moisture and urine near the cat’s skin allowing mould, fungus or bacteria to grow, causing skin irritations that existed prior to the grooming process. After effects of mat removal procedure can include itchiness, skin redness, self-inflicted irritation or abrasions and failure of the hair to regrow. In some cases cats may also exhibit brief behavioural changes. Prevention is the best defence against matting by maintaining regular grooming at home and scheduling regular 6 weekly grooming appointments. Extra fees apply for any matts or knots removed. Accidents: There is always the possibility an accident could occur. Grooming equipment is sharp. Even though Aristocats uses extreme caution and care in all situations, possible problems could occur including cuts, nicks, scratches, quicking of nails etc. In most cases this can happen when a cat is wiggling or moving around. During the grooming session please don’t allow your cat to see you or talk to it as this encourages the cat to move and wiggle. Every effort will be made to ensure your cat is groomed as safely as possible. Often cats behave much better when the owner is absent or it is not aware of the owner’s presence, please be discreet at all times if you are waiting for your cats groom to be completed. Aggressive or Dangerous Cats: Owners must inform Aristocats if your cat(s) bite, have bitten or is aggressive to people, other cats or specific grooming procedures. Muzzles may be used if necessary. Muzzling will not harm your cat and protects both the cat and the groomer. Aristocats reserves the right to refuse/stop services for such cat(s) at any time before or during the grooming process and charge a Handling Fee in addition to the regular grooming fee. If your cat should bite, you agree to be responsible for any and all related medical bills, recovery costs, loss of income and equipment damage. comfort, in styles that will not add to their stress. You agree to notify Aristocats of any signs of injury or possible illness before any check-in for services as soon as the condition appears. In the best interest of your cat this agreement will give Aristocats permission to obtain immediate veterinarian treatment should it be deemed necessary. We will do our best to contact you first, and then take your cat to your authorized veterinarian or to the nearest veterinarian that is available. It is agreed that all expenses for veterinarian care will be covered by the cat’s owner upon reading and agreeing to this agreement. Aristocats reserves the right to cancel services where a cat with a potentially infectious condition exists. Parasites: Aristocats strives to be a flea free salon. If fleas are found during the grooming process, your cat will be treated with Capstar or an alternative natural product. A $10-$15 fee applies in addition to the regular grooming fee. The Capstar pill will kill the fleas on your cat as well as keeping our facility flea-free. Ticks found will be removed and grooming may cease at whatever stage it is at. Vaccinations: We require that all kittens have completed their third round of vaccinations before they can be groomed at Aristocats. Adult cats are required to be up to date with their vaccinations as per your vet’s recommendations. Deposit: We require a $50 deposit on all bookings to secure your appointment. Payment can be made with Credit Card or Direct Deposit at the time of booking. Bookings that have not had a deposit paid 48 hours prior to their scheduled appointment may be offered to another client. No-shows, Cancellations: No shows, last minute cancellations (less than 24 hours notice) or continual re-scheduling will forfeit any deposit. Or will incur a cancellation fee if a deposit hasn’t been paid. You may reserve future appointments by credit card payment for a full groom fee. We understand there are emergency situations and will work with you, but not on a continued basis. Late Arrivals: Please note that arriving late for an appointment could mean that we are unable to provide the full service you are booked in for as there is an allocated time for each service. Please be respectful of our time as we are a by-appointment business, and another client could have taken your appointment. Late Pick-Ups: Please be on time to pick-up your cat(s). Any cats picked up after the allocated pick up time will incur a $5 per 15 minute fee in addition to any grooming fees. Media Release: We may use images (photographs and/or videos) of your cat/s on our social media platforms and/or as part of our email marketing campaigns. By signing this form I consent to images of my cat (photographs and/or videos) being used for these purposes and hereby waive any right to inspect or approve the finished photographs or electronic matter that may be used in conjunction with them now or in the future. I also waive any right to royalties or other compensation arising from or related to the use of the image. By using our services, you agree to not hold Aristocats, its owners, operators or employees responsible for any damage, loss or claim arising from any condition of your cat either known or unknown to Aristocats. In the event an emergency should occur with my animal, or in the event special services or handling are required as deemed necessary by Aristocats in the care of your animal, you agree to pay all such costs in full. You also agree to pay the full grooming fee at the time of pickup of your cat/s & understand that your cat/s will remain in Aristocats’s care until payment is received. It is further understood these clauses apply to any and all cats groomed by Aristocats.